Kristie Kenney was appointed .U.S. ambassador to Thailand by President Barack Obama in July 2010, and was confirmed on September 29, 2010. Kenney gained early exposure to U.S. government service as a tour guide for the US Capitol, an intern at the House of Representatives, and a Senate page. She earned a Masters degree in Latin American Studies from Tulane University and a Bachelor’s degree in Political Science from Clemson University. Between college and her ambassadorships, Kenney held a variety of roles including Economic Counselor at the United States Mission to International Organizations in Geneva, Economic Officer at the US Embassy in Argentina, and Consular officer at the US Embassy in Jamaica. She was also Senior Advisor to the Assistant Secretary for International Narcotics and Law Enforcement. 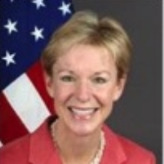 Kenney is the first female US Ambassador to Thailand. She speaks Spanish and French. Her husband is William Brownfield, who has served as ambassador to Colombia, Chile, and Venezuela.